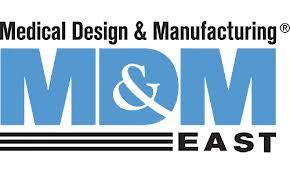 The 30th anniversary of the Medical Design and Manufacturing – MD&M East conference is now open for registrations. You can sign up online for free passes to the exhibits floor and get early registration discounts for the conferences, tutorials and innovation sessions. Located at the Pennsylvania Convention Center in historic Philadelphia PA., the Conference runs June 17th through 20th, with the Exposition floor open June 18th through 20th. Tuesday June 18, 2013 on Validation: Process & Method Quality Control – Dr. James Donnelly, Chief Science Officer, Siemens Healthcare Diagnostics Inc. The MD&M East conference also features lunch networking sessions and lunch discussion panels, as well as breakout groups for meeting with the influencers and leading developers in the industry. If you can’t attend the MD&M conference in June, or make it to Philadelphia, then consider the Design East 2013 show in Boston. Also, coming up in April on the West Coast is Design West 2013.